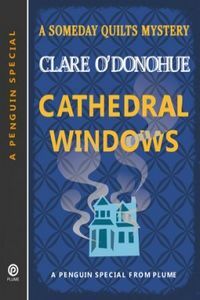 Cathedral Windows by Clare O'Donohue: Synopsis and Online Purchase Options. Synopsis (from the publisher): Christmas is just around the corner in the Hudson Valley. Nell and her friends at the Someday Quilts shop should be making eggnog and finishing up the stitching on their last homemade gifts, but when an arsonist strikes and a beloved teacher becomes a suspect, the ladies rally behind him to clear his good name. Will they succeed in time for him to spend Christmas among loved ones or will this be a chilly winter for the town of Archers Rest?